As the business, sporting and entertainment center of Israel, Tel Aviv is perpetually in motion and youll find people into everything from soccer to classical music. Once your plane lands at Ben Gurion Airport, you have two options. You can go east, heading through the Judean Hills to Jerusalem, or you can go west, past the citrus groves to Tel Aviv. If you go east, your journey becomes a mix of ancient history and religion; go west, and you come to Israels bustling economic capital, a Mediterranean oasis with sparkling beaches and a pulsating nightlife. Tel Aviv is a narrow piece of land located between the Gaza Strip in the south and Lebanon in the north, with mild winters and hot, humid summers. As the business, sporting and entertainment center of the country, it is perpetually in motion and youll find people into everything from soccer to classical music. The city was founded early in the 20th century, when a group of residents from nearby Jaffa were looking to build a garden suburb and purchased some land to the north. Thus was born the first new Jewish city in 2,000 years, and these desolate sand dunes covering ruins of the past would become a thriving metropolis. The garden suburb grew 20 times its original size by World War I, when Turkish rulers expelled the Jewish population. The British occupied the city in 1917 and permitted the Jews to return. In the following decades, Tel Aviv blossomed into a city of wide, tree-lined boulevards and 1930s Bauhaus-influenced architecture. After years of border changes, Tel Aviv was formally combined with the ancient city of Jaffa in 1950, resulting in Tel Aviv-Jaffa, together an enchanting mix of the 20th century and antiquity. A rich array of educational resources lies within easy grasp, including the heralded Diaspora Museum (Bet Hatefutsot), the renowned Museum of Art and the remarkable Tel Kasila excavation site. It is no surprise that learning institutions treasure this city and its surrounding area. A rich array of educational resources lies within easy grasp. 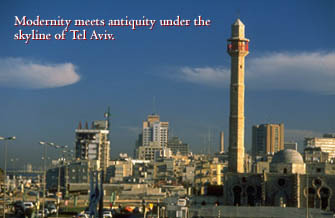 This includes the heralded Diaspora Museum (Bet Hatefutsot), located at Tel Aviv University. Unlike a typical museum, it contains no preserved artifacts. Its principal aim is reconstruction. Striking displays of intricate models of synagogues from across the globe and a memorial column commemorating Jewish martyrdom are among the most popular exhibits. Then theres the renowned Museum of Art, with its Impressionist and post-Impressionist works, and the remarkable Tel Kasila excavation site, in which 12 distinct layers of civilization have been uncovered. There, an ancient Philistine temple and Hebrew inscriptions from 800 B.C. can be seen. Tel Kasilas complex includes a planetarium and 11 pavilions that display varied relics. On a modern note, to the south of the Yarkon River is the trendy quarter known as Little Old Tel Aviv, where the citys three major north-south roads begin and cafés, restaurants and bars are found. Tel Avivs white Mediterranean beaches, sunny weather and smart hotels make it a year-round tourist resort, while sleek office towers and a modern skyline remind one that this is Israels center for commerce. Fairleigh Dickinson University established a campus in Tel Aviv in 1996, when it launched undergraduate and graduate degree programs for Israeli students. FDU-Israel offers several degrees, including BA degrees in psychology and communications; a masters degree in clinical psychology; and the bachelor of arts in individualized studies degree with a concentration in hotel, restaurant and tourism management. Having a branch campus in Israel places Fairleigh Dickinson where three continents  Africa, Asia and Europe  meet. While the landscape is a mixture of desert, ocean, flatlands and mountains, the blend of people and cultures is just as diverse. As you disembark at Ben Gurion Airport, indeed, there are no wrong turns in this time-honored land. Whether east or west, the region is steeped in history, yet bound to the future. Such a location cannot help but provide incomparable lessons, the very aspect that makes Tel Aviv a flourishing bough on the Fairleigh Dickinson family tree.